Recently in Boulder, Colorado I had a chance to play guitar for the Ron Miles quintet. The trumpeter / cornetist Ron Miles, is a long-time mentor and friend, and we have at times appeared together live and on each other’s recording projects. Both Ron and I come from a Denver-based community where elders like the great guitarist, Dale Bruning, taught us both, as well as more famous players like the incredible guitarist, Bill Frisell. Bill and Ron play a lot together, and so there is an additional pressure for me when performing live with Ron – as though I have to, in some way, “fill the shoes” of one of the greatest jazz guitarists of all time. And so, inevitably, although Bill Frisell is truly one of my guitar idols (and a genuinely nice person), in the spirit of the jazz tradition I have often found myself consciously trying not to sound like him. When I think about it, I don’t feel like I sound like a “jazz” guitar player at all, even though Dale Bruning (Bill’s and my mutual teacher) sounds like the essential jazz guitarist and I am still unpacking ideas from lessons with him. Part of this has to do with which era of jazz music I was listening to early on. Although the first jazz record I ever bought was fittingly Louis Armstrong’s “Hot Fives” and “Hot Sevens” I quickly developed a fascination with the 1960s movement of what was called the “new thing,” “avant-garde jazz,” or “fire music” – while at the same time being enthralled with English art rockers like Fred Frith, Robin Guthrie, Vini Reilly, and Kevin Shields. The sparkling beauty of the Cocteau Twins and The Durutti Column balanced with the wall of distortion overtaking you at a My Bloody Valentine show and the utter improvisatory mastery of Fred Frith, who like me shares a love of literature, of how important imagery and texture can overtake any narrative and disrupt the lived-time in which a performance exists – yes something entrenched in all this is where I am coming from musically. 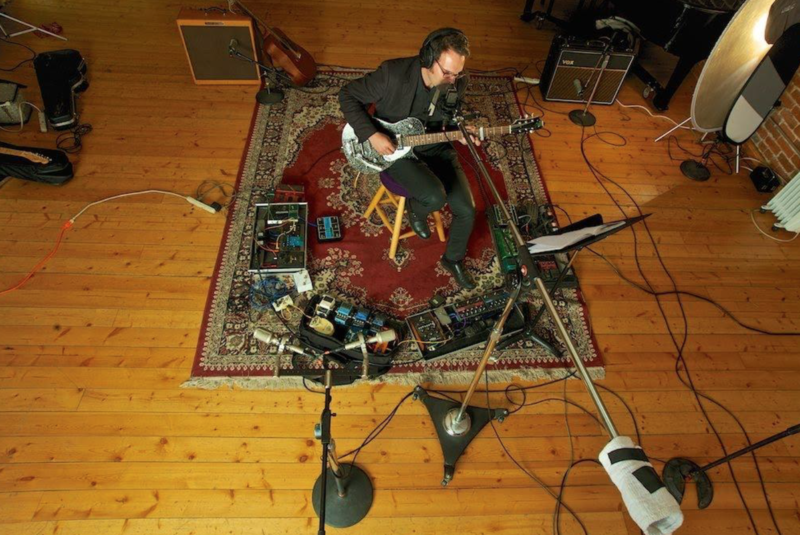 Part of this has meant that I have explored heavily with lots of electronics and guitar effect pedals, which at times makes me feel isolated from other players on stage, or that I simply take up too much real estate on stage. In recording and manipulating loops of sounds I manifest layers of unconscious memory into a mind-manifested or psychedelic space. Lately, unfortunately, I find myself too entrenched in work of the academic world to play a lot. I am no master of putting this all together like Nels Cline is, nor am I as uniquely radical as Mary Halvorson is – though I love their work. I had discussed this frustration with Ron, who writes very beautiful, but at times difficult, music. I have always found it challenging playing over form, and when I play maybe one show a year where I am reading notated music, finding way to manifest what I do in the space of someone else’s music is an ethical and spiritual challenge. So I was especially encouraged when Ron sent a link to a recent performance of the wonderful piano player, Jason Moran’s. Ron Miles and Mary Halvorson are in the midst of recording an album with Jason Moran – and now you’ll see why I’ve traced this lineage here: because Jason Moran recently performed at the Kennedy Center in Washington D.C. with the great George Lewis. Moran had sent a link to Ron and Ron shared it with me, and that’s how musical community works – simultaneously ephemeral and deep. Voyager [1,2] is a nonhierarchical, interactive musical environment that privileges improvisation. In Voyager, improvisors engage in dialogue with a computer-driven, interactive “virtual improvising orchestra.” A computer program analyzes aspects of a human improvisor’s performance in real time, using that analysis to guide an automatic composition (or, if you will, improvisation) program that generates both complex responses to the musician’s playing and independent behavior that arises from its own internal processes. It would be one thing to simply identify this “program” or “composition” as merely some sort of post-human experiment in artificial intelligence, but Lewis instead locates Voyager, like jazz, within an African-American musical continuum. Musical computer programs, like any texts, are not “objective” or “universal,” but instead represent the particular ideas of their creators. As notions about the nature and function of music become embedded into the structure of software-based musical systems and compositions, interactions with these systems tend to reveal characteristics of the community of thought and culture that produced them. Thus, it would be useful here to examine the implications of the experience of programming and performing with Voyager as a kind of computer music-making embodying African-American cultural practice. Lewis spent his early years as a trombonist in Chicago, studying with Muhal Richard Abrams as part of the Association for the Advancement of Creative Musicians (AACM), a collectivist organization formed in the 1960s and consciously advocating as a cultural counterpart to the NAACP during a time when jazz was losing spotlight to rock and roll. The AACM reacted both to the white dominance of avant-garde classical music and the label “jazz” as a culturally locating label for Black performers and artists. Many of the musicians in my generation were critical of the 1990s depiction of the jazz tradition presented by Ken Burns and the great trumpeter, Wynton Marsalis. Marsalis, for all of his unquestionable ability as a player, came to symbolize a late 1980s and 1990s revival of “modern jazz” from the 1950s. This was part of a larger cultural moment when African Americans saw more mainstream representations of middle class status in television programs like The Cosby Show and later The Fresh Prince of Bel-Air while simultaneously a more avant-garde contingent of Black activists formed around Hip Hop with crews like Public Enemy consciously looking back to the militancy of the Black Panthers. On the west coast, in the aftermath of N.W.A., Dr. Dre was producing his classic, The Chronic, which layered thug life on top of Afrofuturist samples from Parliament Funkadelic. Afrofuturism grew very much out of the alternative histories and metaphysics of musicians like Sun Ra, who visited Saturn, led a communal big band, and even lectured at Bekeley in 1971. To broaden the stigma that musicians like myself felt at the time from the facile trope of the mysterious dropping off point of jazz history in Ken Burns’s Jazz documentary, which left avant-garde jazz movement only cursorily mentioned in the last episode of the series and favoring an ideological presentation of jazz in line with the government’s use of the music in international diplomacy after State Department visits, just look at Miles Davis’s last two albums, both of which won Grammy awards. The first of these was the big-band collaboration with Quincy Jones, in which Davis made an uncharacteristic reflection back to the “cool jazz” era of the late 1950s with arrangements by Gil Evans. Released a month after the concert and a month before Davis passed away, Miles and Quincy: Live at Montreux gave a fitting reflection on the late artist’s life. It also definitively proved to anyone who disliked his more experimental later work that Davis still “had it.” Doo-Bop, the last studio album by Davis and in which he embraced Hip Hop, was recorded in early 1991 and released in the summer of 1992 to poor critical reviews. Even before Ken Burns, people were already casting “jazz” as something smooth, sophisticated, and “dead,”—and therefore congruent with a politically regressive ideology that wanted to code progressive music of the 1950s with a feigned conservative nostalgia for “I like Ike” and Leave it to Beaver. In other words, an ideological erasure of the 1960s. Moreover, much African-American culture, from Toni Morrisson’s ghost in Beloved to Kendrick Lamar’s interview with the late Tupac Shakur on To Pimp a Butterfly, has consciously dealt with the living dead, murdered by white oppression and traumatically compacted into a doubled reality articulated in its early form by W.E.B. Dubois. The post Black Arts Movement space, which sought in ways to insulate and foster the self-determination of a separate space and aesthetic standards not reciprocal or refractive of the white European tradition, is illustrated in the complex metaphysics of Sun Ra, The Art Ensemble of Chicago, Anthony Braxton, George Clinton, and George Lewis. It extends into the 21st century in the visual artist, Nick Cave, a utopia that is not liberal but critical of the conditions within liberalism that are hostile to particular groups of people. As I learned while writing and researching my Master’s thesis comparing avant-garde jazz and, weirdly, Emmanuel Levinas’s ethical philosophy (under Ron Miles among others), the mostly white jazz critics in the late 1950s were already anticipating a completely “new era” in jazz. My own whiteness and the ways in which European culture and African American aesthetics were incommensurable were unveiled to me, especially in the context where musical form in externalized, document-centered fashion, was removed by players like Ornette Coleman. But part of Coleman’s iconic stature as revolutionary was being written into jazz history in the wake of the untimely death of saxophonist, Charlie Parker in 1955. Charlie Parker was only 35 – younger than I am now, and godlike in my mind always. The lightning speed, the way that, written down in omni books it still only vaguely makes sense… he was truly beyond it. As AACM saxophonist Anthony Braxton says of players like Warne Marsh and Paul Desmond, they were “so in that they were out”. Charlie Parker, to me, remains uncontainable. The ethical impulse of avant-garde jazz in part radically emphasizes one’s own embodiment in the communicative instance of interacting with others. In this instance there is no essentializing going on for the performer without being accountable for the presence of one’s body in space. But being able to be in and out at the same time in the way Braxton describes has ethical and political implications I can only partially understand on an ontological level because my body does not share the same exigence as a black body in my particular political-existential context. Thinking about the 1950s, nationalistic musics…rejoicing in the nationalistic musics, whether it was Frank Sinatra, Johnny Mathis…the emergence of Motown…in the timespace of the sixties suddenly everything changed and we began to experience the music of Ravi Shankar, global musics and global music logics. More and more it became clear to me that music was not going to not simply be a hobby or an outlet for something that would be entertaining but rather music was was part of a spiritual discipline, because this is what I was looking for. I was looking for myself…to understand myself, and I was looking for a way to understand those who were not myself and I was looking to understand the community the community that I was born in. Anthony Braxton characterizes the 1960s and his experience with the AACM as a shift from idiomatic to trans-idiomatic music. We know so very little in broader culture of what Braxton means and can learn so much by examining what it means for his work and life to be included in the “official-ness” of a genius award. We can learn similarly from George Lewis. Anyone who is serious about understanding music (jazz or not) ought to read Graham Locke’s Forces in Motion: The Music and Thoughts of Anthony Braxton. This book and this way of thinking is a good introduction to Braxton’s fellow AACM peer, George Lewis. We can also learn from recent aesthetic theory. In continental philosophical thought or “theory” of the period in which Braxton and Lewis were developing within the AACM there was an intense interest in conceptions of “desire beyond lack” (Levinas), or “signification beyond negation / dialectics”… a recognition of differance in Derrida or the difference of Nietzsche’s eternal return in Gilles Deleuze and Roland Barthes. It is not exactly accurate to align European continental thought with African American music in the 1960s. Nevertheless, I think they both speak to Braxton’s characterization of the trans-idiomatic in albeit different ways. Much of the avant-garde composing forms enact what Deleuze sees as difference within the eternal return, which operates beyond a process of signification. Avant-garde jazz or “free jazz,” especially after Ornette Coleman (see earlier experiments with Lennie Tristano’s group), aligned with an ideological stance that rejected the ways that “jazz” or “Black” music was being co-opted by a (white) government who sent Dizzy Gillespie and Louis Armstrong (who were from different generations) on State Department missions to spread liberal ideology against the claims by communists that the U.S. wasn’t really as free as it claimed because of its treatment of Black people. This situation is described well in Iain Anderson’s This is Our Music: Free Jazz, the Sixties, and American Culture. It is the ongoing element of cultural critique and pessimism with respect to “jazz” being ideologically presented as an essentially American artform, which the avant-gardists saw but Theodor Adorno was not culturally competent enough to observe, that carries on in George Lewis’s work. In the video link to the awards ceremony / performance with Voyager, we hear George Lewis discuss the ways interacting with the computer make us more aware of what is human. We also hear an audience member reflect that she is more interested in the computer than the players because she has heard musicians interact onstage before – the post-human element. Another audience member wants to know whether or not the computer can play over forms of jazz standards. Lewis then brings up the political implications of the “uncanny valley,” where designated objects – whether computers or humans – become subjects and begin to speak, it disturbs some people’s sense of exceptional creaturely ontology. It’s not so much about information storage and retrieval. It’s more about … machines reflecting the environment from which they come. So, if that environment is suffused by let’s say African-American musical aesthetics you will hear that coming out in the responses of the machine. Just as we know that certain types of devices, you know, user interfaces or whatever that we sort of encounter are not really designed for us. They were designed for a different community and they reflect that community’s aesthetics, how they think of machines, how they think of bodies, how they think of their relationships, social relationships. So this machine’s approach to social relationships comes from everything I’ve experienced playing with some of the people you have been talking about, and also other people who aren’t so blues involved. So that it reflects, is a reflection of…it’s a reflection of who am and who I’ve been, but also it recombines those elements to create things that…places I haven’t been and situations I haven’t been involved with so that’s where you get this sort of mutation of cultural memory that I think disembodies. And so Lewis is able to show how the aesthetic dilemma mediating with technology and people is only part of the picture. I have emphasized the becoming-located, perhaps the becoming-object in the improvisatory space, but Lewis is able to tangibly show the ways disembodiment and trans-historical being is not a bland universalism but a current of our ancestors moving in us and through us and keeping us “us”. Roger K.Green, PhD. teaches English and songwriting at MSU Denver. His academic and artistic interests intersect one another with a particular emphasis on psychedelic aesthetics and political theology. He has published with Psychedelic Press, UK and The Aldous Huxley Society Annual. He is a former guitarist for The Czars (Bella Union Records) and has released and produced multiple solo albums. He appears with Ron Miles on Blossom (Sterling Circle 2006). He is currently working on a second doctorate in the Joint PhD Program in Religious Studies and Theology at The University of Denver / Iliff School of Theology.